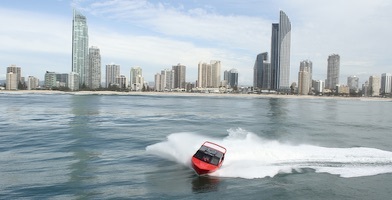 Send that special person zooming around the outer ocean off the shores of the Gold Coast for spectacular views of the Surfers Paradise precinct. Queensland's only offshore ocean jet boating experience, this adventure combines great views with great thrills for the ultimate experience and is the perfect gift for any occasion. Departing Marina Mirage, Main Beach and travelling through the Gold Coast seaway the lucky recipient will be able to enjoy the freeness and wildness of the beautiful, clear blue ocean waters. Blasting past all the Gold Coast skyscrapers down to the beaches of Surfers Paradise they'll spin and slide up and down the coast, passing South Stradbroke Island and Wave Break Island on the return journey. 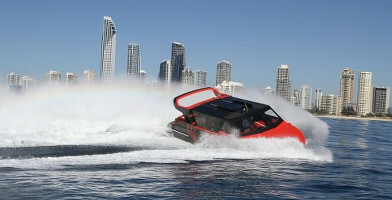 This is the ultimate gift for adrenaline-lovers living in or visiting the Gold Coast! Check out the two available vouchers below; a jet boat ride or a jet boat and helicopter ride combo and start gifting! They'll travel out to sea for an epic 45-minute jetboat ride! If you know someone who would love to receive this epic gift, buy a voucher online today! They'll enjoy the thrills and the views off the coast before seeing it all from up high during a scenic helicopter flight with this gift voucher. Buy here!